People: 88% European descent, 8% Mestizo, 4% Black. Language: Spanish. Religion: 66% roman catholic, 2% protestant, 2% jewish. Uruguay may be pint-sized but it's certainly big-hearted when it comes to attractions. It contains one of South America's most interesting capitals, charming colonial towns and a cluster of internationally renowned beach resorts. 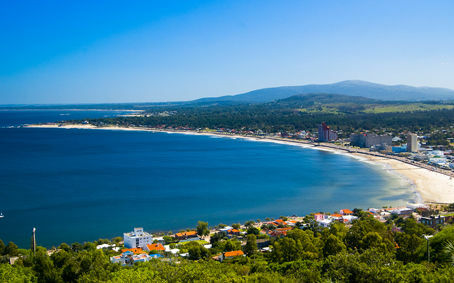 Uruguay -the smallest Hispanic country in South America- is boxed into the eastern coast of South America by Brazil to the north and Argentina to the west. To the south is the wide estuary of the Río de la Plata, while the Atlantic Ocean washes its eastern shore. For the most part, the country's undulating topography is an extension of that in southern Brazil, and includes two lowly ranges - the Cuchilla de Haedo and the Cuchilla Grande. 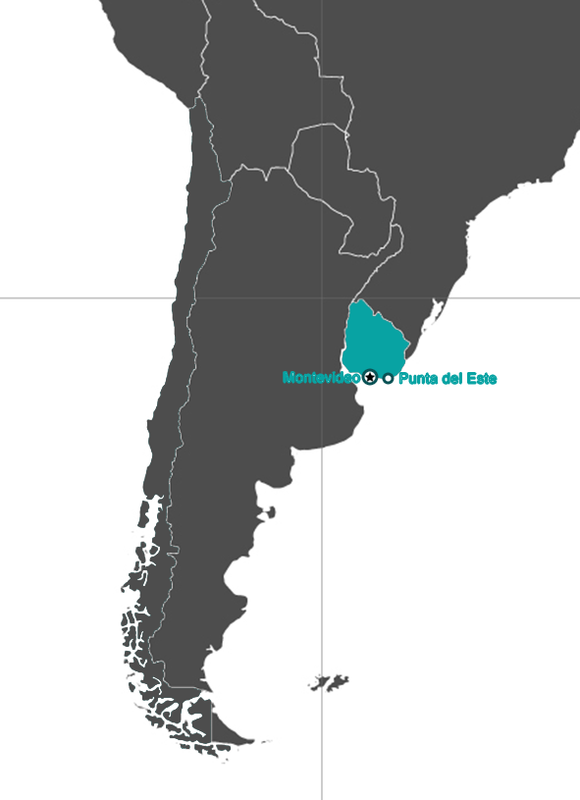 The terrain levels out west of Montevideo, while east of the capital there are impressive beaches, dunes and headlands. Five rivers flow westward across the country and drain into the Uruguay River. The country's flora consists mostly of grasslands, with little forest except on the banks of its rivers and streams. In the southeast, along the Brazilian border, are lingering traces of palm savannah. Wild animals are scarce, although rhea (a bird-like ostrich) can still be seen in areas near major tributaries. The climate is temperate, even in winter, and frosts are almost unknown. Winter (June to September) temperatures range from 10 to 16ºC (50 to 61ºF), while summer (December to March) temperatures lie between 21 to 28ºC (70 to 82ºF). Rainfall, evenly distributed throughout the year, averages about 1m (3ft) over the entire country. Uruguay's main attraction is its beaches, so most visitors come in summer. Along the littoral, summer temperatures are smotheringly hot, but the hilly interior is cooler, particularly at nightspecially at night. Departure from the peninsula through Pinares neighborhood and Punta Ballena with its exceptional panoramic view, continuing on Route Interbalnearia and Camino de los Arrayanes until reaching Piriápolis. We could enjoy the walk by the sea and the hills, San Antonio hill and this European style city. Then visit to Cerro del Toro, Fuente Venus, Punta Fria, port the Argentine Center Thermal Hotel, Piria Castle and the wildlife reserve in the Cerro Pan de Azucar. 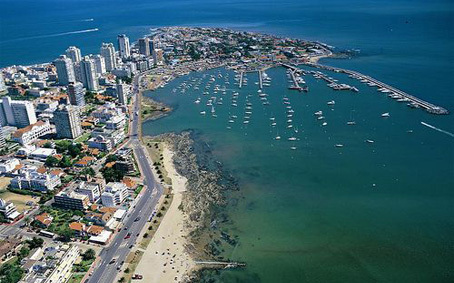 Situated in the Maldonado District, Punta del Este has become one of the main tourist centers of South America in the past few years. It is precisely here, where the Atlantic Ocean is born, that modern urbanization has developed, since their 43-mete-high Watch Tower building. Seaside city, natural and cosmopolitan, it offers a beautiful ramble, sumptuous mansions, modern buildings, and a port with great infrastructure, shops, restaurants and pubs. The Gorlero Avenue is the area where the main commercial and leisure activities are developed, leading to Plaza Artigas, where the traditional artisan fair is. Punta del Este is attractive for its shades and contrasts: Playa Brava, where the open sea is shocking and shows its majesty and on the opposite side is La Mansa, a placid retreat to enjoy its calmness and quietness. Art is also present in Uruguay: Casapueblo is an icon of the place, an architectonic work resembling a sculpture itself, work of art by the Uruguayan painter and sculptor Carlos Páez Vilaró. It is considered one of the main attractions of Punta Ballena and has a museum and an art gallery by the renowned plastic artist.